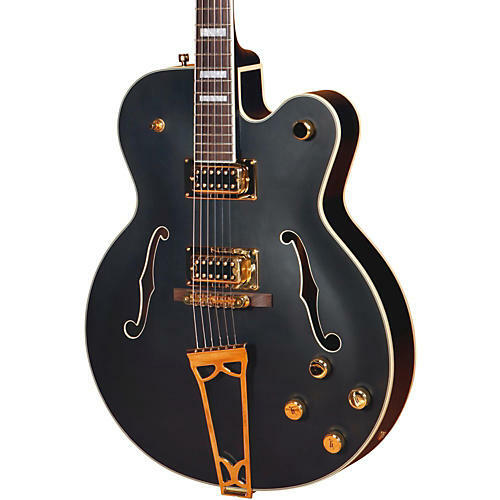 The Gretsch Guitars G5191 Tim Armstrong Electromatic Hollowbody honors the punk rocker with a signature electric guitar. That full-bodied piano-like sound Tim loves is generated by parallel tone bars and a sound post mounted under the 17"-wide top. A harp tailpiece and a pair of "Black Top" Filter'Tron pickups deliver maximum sustain and tuning stability. Grover tuners, big block fretboard inlays, and gold-plated hardware set against the guitar's ominous flat black urethane finish are a recipe for inciting your senses to sonic euphoria. Punk rock warlord Tim Armstrong makes no apologies that the music radiating from his soul is oftentimes loud and ferocious. His guitar tone alone has become as infamous as his world-renowned persona that resulted from playing guitar and singing vocals in revolutionary punk bands from Operation Ivy to Rancid. Armstrong has been asked to contribute his guitar talents in songs from a wide genre of bands, from punk bands like AFI and Bad Religion to hip hop and reggae acts like Cypress Hill and Buju Banton. Strap Retainer Knobs, Adjustable Truss Rod, "Black Top"